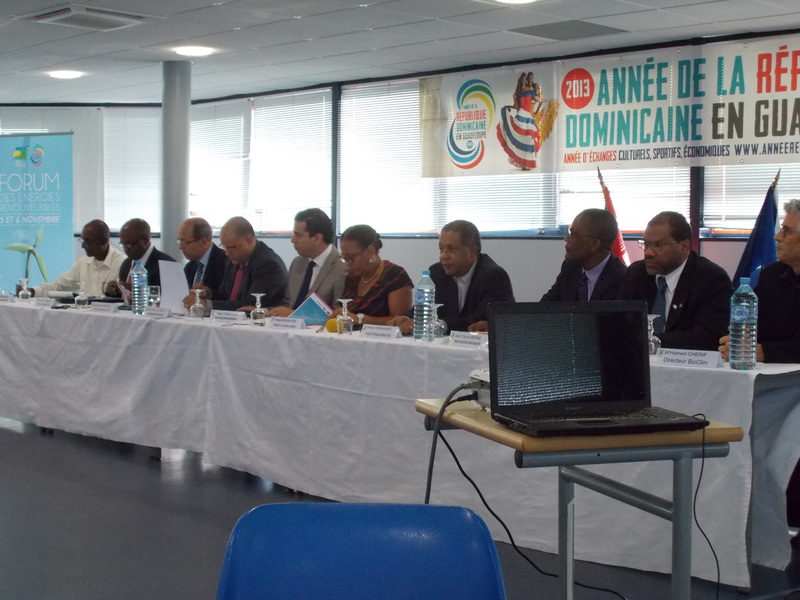 Senior officials at the meeting held in Guadeloupe. Caribbean Export Development Agency (Caribbean Export) in cooperation with the Regional Council of Guadeloupe, the Government of Haiti and the Government of the Dominican Republic organized a meeting of senior officials to discuss a “Policy Dialogue between Haiti, Dominican Republic and the Regional Council of Guadeloupe on the Renewable Energy and Waste Management Sector”, held in Point-a-Pitre, Guadeloupe, from November 5-6, 2013. It is the scarcity of natural resources and the changes brought by global warming that has contributed to the realization of the importance for governments to promote policies that have less environmental impact. Thus the promotion of renewable energy and waste management, have become key actions for a sustainable economic development. To this end, proactive policies are needed to allow such a large investment in this type of industry. It is therefore natural that the Guadeloupe, which has developed in recent years as a technical research center for the development of new technologies in the field of renewable energy and waste management, can share its expertise with Haiti and the Dominican Republic. The event brought together 16 delegates from Haiti, Dominican Republic and the Regional Council of Guadeloupe, as well as representatives from the private sector of Guadeloupe, including the Center for Facilitation of Investment of Haiti, the Center of Export and Investment of the Dominican Republic, the Chamber of Industry and Commerce from the South of Haiti, the Ministry of Energetic Security of Haiti, the National Commission of Energy of Dominican Republic, the ACP Business Climate and the Embassy of France in the Dominican Republic. In addition to promoting public-private sector dialogue, the meeting also sought to create a better enabling environment for the promotion of renewable energy and waste management with a special interest of targeting French investments to Haiti and the Dominican Republic. The opening session of the event included the participation of Mrs. Therese Marianne-Pepin, President of the Cooperation Commission of the Guadalupe Region, Mr. Cesar Dargam, Vice-Minister of Foreign Affairs of the Dominican Republic, Mr. Serge Fernandez, Technical Advisor of the National Authorizing Office in Haiti, and Mr. Escipion Oliveira, Deputy Executive Director of Caribbean Export. The open dialogue between the group served as a valuable platform for mutual policy learning on renewable energy and waste management enabling the participants to share experiences and best practices, providing information regarding the countries’ policies, programmes and priority areas. As part of the activities, the delegation conducted site visits to Genergies, a facility that produces a full range of photovoltaic solutions for all market segments; AER, a non-hazardous waste management facility; and Waste Storage Center in Sainte Rose. These site visits provided the opportunity for participants to view the various production processes of the firms, with the aim of deepening their understanding of alternative energy and waste management solutions. A follow-up investment mission to Haiti and the Dominican Republic with the support of the Regional Council of Guadeloupe and the French Embassies most probably during the 2nd quarter of 2014 is now being discussed as a result. The promotion of alternative energy and waste management are key actions for sustainable economic development. It is within this context that the European Union and Caribbean Export have cooperated with the governments of Haiti and the Dominican Republic under the Program: “Bilateral Trade Development within the framework of the CARIFORUM-EU Economic Partnership Agreement (EPA)”, in order to promote and attract foreign investment in these sectors.